December | 2010 | Eugene is huge! I’m migrating a lot of stuff onto here. Pay no attention to how things are. I’ll publicize it when it is all ready. How the heck did you find this place anyway? When I was a kid, I wondered why it was that people thought randomly writing nonsense phrases in Japanese or Chinese on their body or on their T-Shirts was such a fad. It even started happening that people put these in movies and music videos in order to make themselves seem cool. All this, nobody ever seemed to touch Korean. Maybe because it was less known or something. Now I see this video where hangul is a predominant feature, and I’m kind of wishing they hadn’t made it so. It seems less cool as most of the hangul is literal translations of what the woman is saying, and in Korean, it doesn’t seem to make as much sense. It’s like, taking random phrases out of context. Anyway I guess it’s good that Korea’s finally getting acknowledged, but… Yeah.. If you recall, I wrote an article about medical tourism a while ago. The Seoul Medical Tourism Center had an event whereupon non-Korean citizen residents could apply for some kind of free medical service. This included botox, skin whitening, and the like. I didn’t want to go for anything really major, so I applied for only teeth whitening, and I won! I went and got my teeth whitened yesterday. I got my teeth whitened at the Hus’hu clinic. Let me tell you about the experience. The Hus’hu clinic is located in Apgujeong, just outside of exit 3 of Apgujeong station. My appointment was at 11:30 yesterday and I got there a little early. As soon as I arrived, I went to the reception desk and was greeted and directed in English. This was a bit surprising because in almost all of my phone conversations with the clinic, they spoke to me in Korean. Next, after filling out a form, I was taken through the halls of a very posh looking clinic to a small dental office. The doctor came in and asked me if I spoke Korean. I replied that I did, and he explained to me in Korean about the process I was about to go through. The staff informed him that it would be best to stick to English. So he switched to English and said everything he already said in Korean. Now, I am a Korean speaker, but Korean is not my first language. When it comes to medical procedures, English is a good thing. The staff were all helpful and polite. After explaining everything to me, my teeth were cleaned. It’s been quite a while since I had any dental work in the U.S., but one thing I always remember about it is that it takes a long time, it tastes funny, and sometimes it hurts. In this case, they covered my whole face except for my mouth and I pretty much fell asleep. That’s how gentle the dental hygienist was. Soon after cleaning my teeth, the whitening process began. This is where they put some kind of bleaching gel on my teeth and shot it with some lasers (I assume to speed up the effectiveness of the gel). Here, I actually did fall asleep. When I woke up, it was because of a shocking pain I felt in one of my bottom teeth. I remembered that they said this was normal, however, so I fell asleep again. After the whole thing was over, my teeth were feeling extremely sensitive. The dentist told me not to drink anything with too much acid or color, such as cola, coffee, or (gasp!) Kimchi, for two whole days. Imagine my horror upon returning home after work. My wife made me a big Korean meal with rice and lots of banchan and kimchi. I couldn’t eat any of the kimchi and I was feeling really bad because of it. But my wife said she liked my new smile. It’s only two days, so I guess it’s worth it. So how much whiter are my teeth? Well, I didn’t have the foresight to take a before and after picture, that was done by the clinic itself. They told me that my teeth were already a pretty light shade (though not totally white). They said I’d be able to jump up two or three shades (though still not totally white). What I got is amazing. My teeth before had a little bit of discoloring due to some calcium deposits growing on the front of my teeth, this process appears to have totally erased them, and my teeth now look bright and radiant, whereas before, they looked kind of dull and a bit yellow in some parts. Now their color is uniform and more healthy looking. I’m very glad I went to Hus’hu clinic for teeth whitening, and I think I’ll actually start using them as my regular care dentist from now on, simply because they are thorough and honest, and don’t leave me wondering about any procedure. I would recommend it to anyone who wants whiter teeth with fewer worries. World Cup 2022 selection to be announced later today! At 1600 CET, FIFA will announce the hosts of the 2018 and 2022 world cups. I mentioned this in a previous article. 2018 will go to a European country; England, Portugal/Spain, Belgium/Netherlands/Luxembourg, and Russia. 2022 will go to either the US, Qatar, Korea, Japan, or Australia. I’d like to change my previous prediction of Russia and the U.S. I believe that England will get 2018, and the U.S. will get 2022. England last hosted the cup in 1966. They are overdue. Spain last hosted in 1982. As for the other countries, Benelux does have a strong bid and central location, but the 2006 cup was in Germany, relatively close to those countries. Russia I thought had a good chance, but I’m thinking now that FIFA is more concerned with money, not charity to small countries. I think the U.S. will host in 2022 simply because the North American continent hasn’t hosted the cup since 1994, while Asia has in 2002. Australia would be an obvious contender if it hadn’t moved into the AFC a few years ago. As all of the bids other than the U.S. are Asian, I think FIFA will give the hosting rights to the U.S, so that China (and Japan and Korea) can prepare a 2026 bid free of European and American competition. So, let’s find out what happens later today and we’ll see if I was right. GO USA and GO KOREA. Edit: I was totally wrong. Russia got 2018, and Qatar got 2022. Those will be two world cups that are poorly attended if you ask me. 2026 will most likely be in the U.S. as all Asian and European countries aren’t allowed to bid. USA 2026! Here’s something cool. 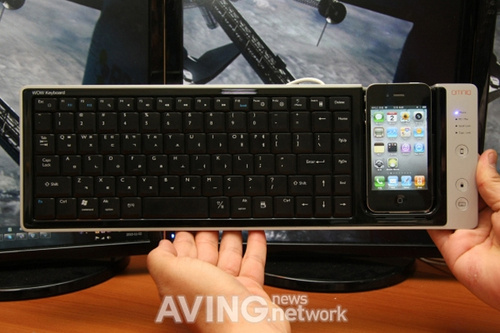 This article on gizmodo talks about a keyboard with an iphone dock. It’s called the WOWKeys keyboard and is for sale only in Korea. Now I ask, why would anyone need an iphone dock on their keyboard? The iphone when docked in this keyboard acts as a number pad, a trackpad, and a remote. I think using it as a trackpad is a pretty neat idea, especially if you are working on something on your computer that involves drawing and aren’t proficient at mouse drawing. The number pad aspect is kind of silly. I mean, the number keys themselves are a tried and true standard. Why would anyone need to use their iphone as one? That would be like putting a camera outside your house and using a flat screen TV right behind it instead of just installing a window. Sure, it’s a high tech solution, but superfluous. The only reason I can assume it’s there is because it saves keyboard space. And if that’s the point, then I guess it makes sense. I’ve been using an iphone for a while, but I don’t know if I’d buy this particular product. Anyway, it’s apple certified so, I guess Apple thinks it’s a good idea. So readers, would YOU use this keyboard?